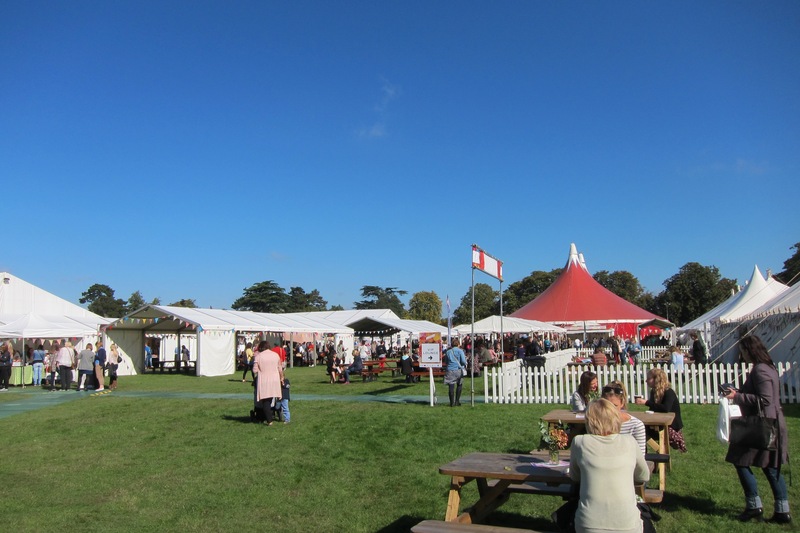 During mid September I headed to The Handmade Fair at Hampton Court. Over the course of three days Kirstie and her handmade team brought together a huge number of makers and delivered an impressive number of practical craft sessions over three days. I attended on the Saturday with my Mum for a day out together, doing something that we both have a shared passion for, handmade crafts. The scale of the Handmade Fair was impressive, with lots of delicious places to eat and many beautiful handmade crafts on display. During the day we spent time going in between the workshops, sessions we had booked onto, and the shopping spaces. In my last blog post I told you about the Mollie Makes Mash Up I attended. As part of the Full Experience ticket there were two other making sessions you could take part in as part of the ticket. 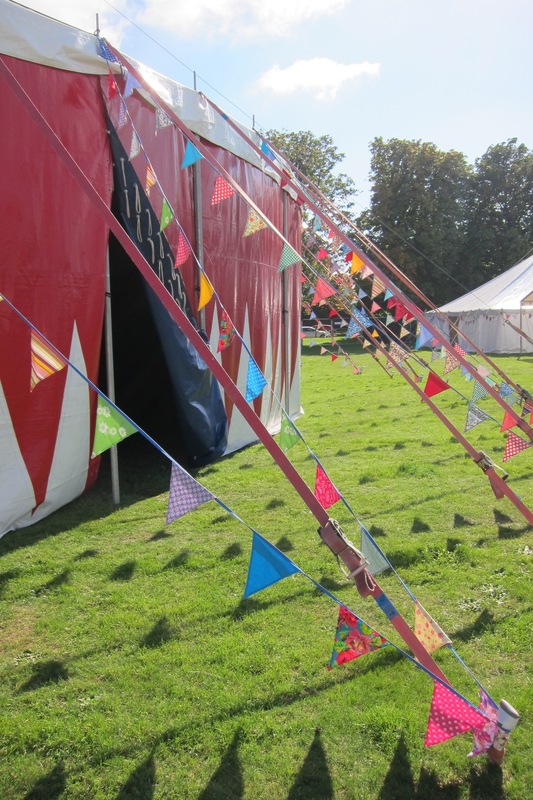 One of the sessions we attended was called Grand Make and in it we made tibetan poetry bunting. The session left me with lots of ideas and thoughts on different ways that I could take this idea and make it my own, and create something for my home or for friends as gifts. Despite sewing for a number of years I've never made bunting and think that it would be a lovely idea to preserve some of my favourite pieces of fabric and add words to the bunting in a handmade project. 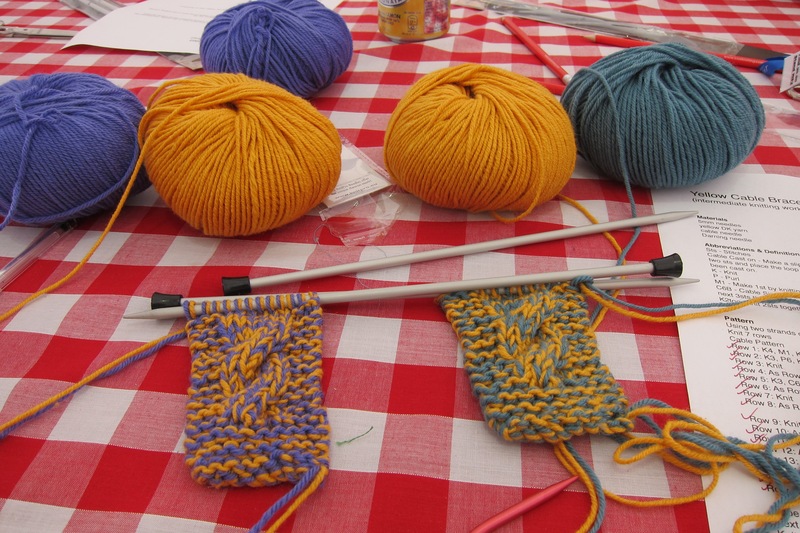 Later in the day we headed to the Yarn and Textiles Skills Workshop, we had chosen the intermediate knitting session run by Susie Johnson. During the skills session we made a knitted cable bracelet. Using two contrasting colours of wool I followed the pattern we were provided with. I've never knitted with two yarns before and thought that the look of the final piece was bespoke and something I'd like to try again at home. After taking part in this session it has made me rethink my approach to knitting. I'm currently making a cosy cable cushion cover and it is taking me real motivation to keep going as it is such a large complicated project. Perhaps smaller and simpler knitting projects might be the way to go to get back into knitting full flow! I think a pair of fingerless gloves or wrist warmers may be a good project for the autumn. 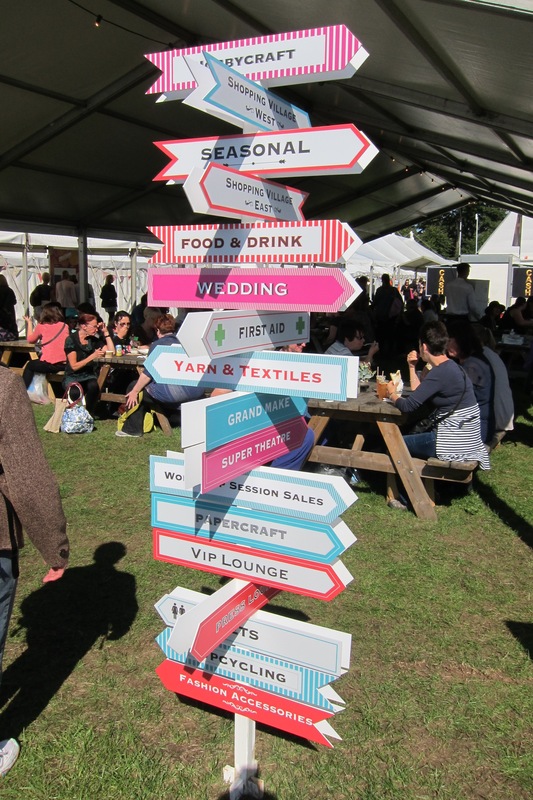 In between our workshop sessions we refuelled with drinks and headed into two huge shopping village tents. Spending time walking round the stalls I felt inspired, as did my Mum, in many ways. A few key sellers stood out as being memorable to me and struck a chord and so I wanted to share with you their links and what I liked about their work. Ranging from small one person businesses through to large brands, each of the following interested and inspired me in different ways. Sarah Pye is an artist and was exhibiting her paintings at the fair. Sarah was painting whilst she was at fair, so it was amazing seeing her work. Both my Mum and I bought a few of her cards, they were just so beautiful. Rather than post them to others I think I'd like to keep mine and get them framed. I really love Sarah's style and the way that she has captured nature and the feeling of the seasons. 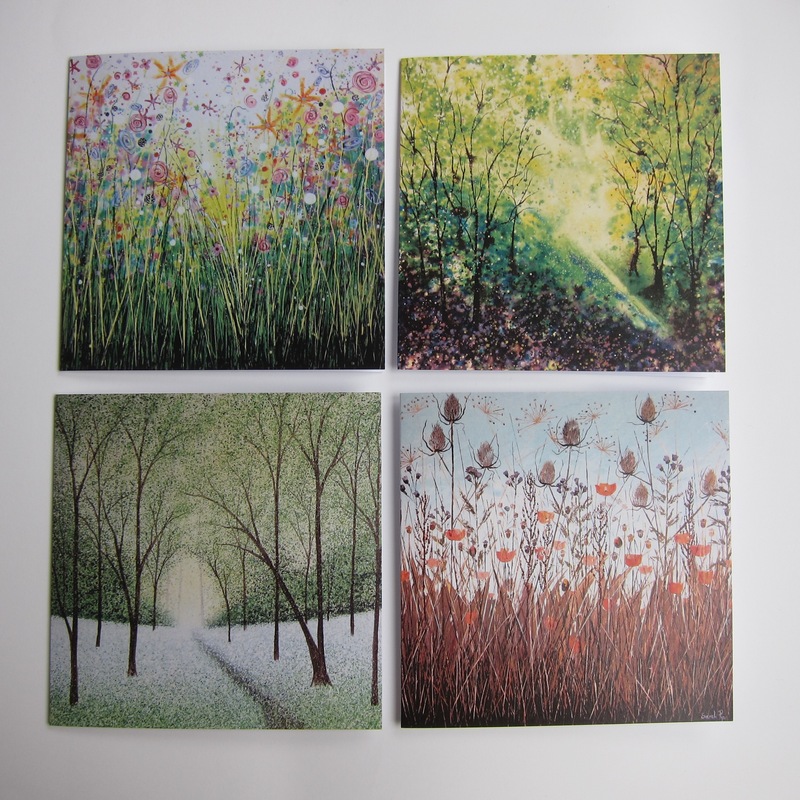 Here are the cards that I bought, each one feels magical with the use of colour and light. Oglee Poglee create craft experiences for children. I adored the children's crafting kits. It's such a lovely business idea to create the different options they have available to help spark children's creativity. We have quite a few friends and family with children that these kits would be suitable for and so we will be getting a few of them as birthday gifts. Katie Essam is a contemporary applied artist who stitches pictures using vintage themes. The wellington boots and chicken designs were really unique with a real attention to detail. I'm toying with buying a piece for our home at the moment. Hannah Bass creates contemporary tapestry kits creating designs for city maps. I loved them so much and thought that the style of tapestry was something so very different that I hadn't come across before. I love the use of colour and being a map lover thought that these were just stunning. I have done tapestry in the past when I was a lot younger and seeing Hannah's stand made me think about having a go once again. Mrs Moon sell yarn and haberdashery items. What made me stop and spend time at the stand was the beautifully soft yarn they had on display called Plump. I think that this may be on the list of very special treats I'd like to buy myself and so will need to start saving to buy a few skeins of this. I'd love to use Plump to make a blanket, the yarn is super chunky and is 80% ethically sourced superfine Australian merino wool blended with 20% baby alpaca, and the colours were just delicious. Cool crafting are based in Cumbria and sell crafting supplies. 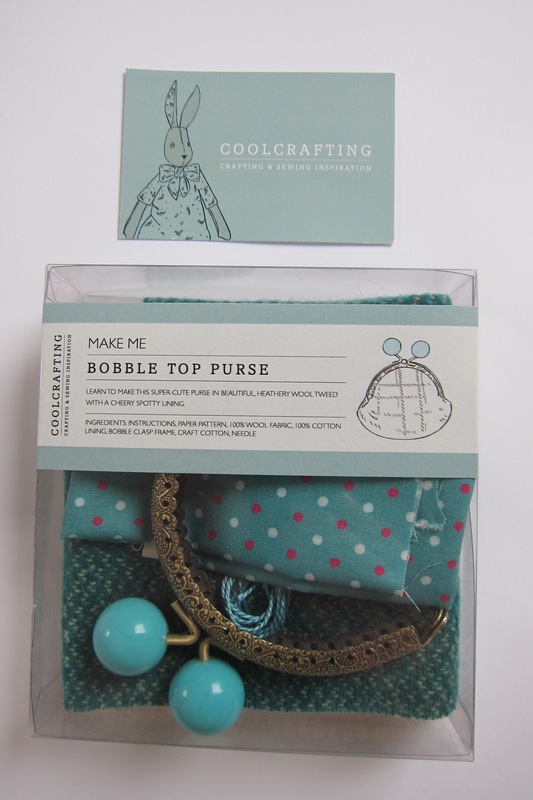 I bought a Make Me Bobble Top Purse kit. I hadn't seen the type of clasp used before and seeing the big bobbles in one of my favourite colours, as well as matching fabric together in a kit, was all I needed to make the purchase. I loved the idea of using cotton and a tweed material together in one project. I haven't made anything using this fabric combination before so I thought it would be a great project to try on a rainy autumn weekend. The Make Me Luna Lapin and Reynard the Fox kits, along with the clothes you can maker them, were just beautiful and something I'd love to also try and make. Cricut make one of those gadgets that you long to own, suitable for both paper crafters and sewists, the cutting machine seen up close was really amazing. The Cricut cutting machine can cut fabrics and a whole range of materials into shapes. It's very temping to start saving for this as it would be fantastic to use for party decorations and craft projects. The Hobbycraft tent was packed full of nostalgia for me. The entire range of Kirstie Allopp's craft kits were on display. It's great to see these kits having a revival. When I was young I was given these types of craft kits as birthday and Christmas gifts and think that they have probably played a big influence in the range of handmade crafts I like to try. Finally Silverdashery make stunning jewellery shaped into crafty items. I particularly loved the Knit necklace and would adore a commissioned single buttoned necklace, maybe I'll hint to Mr C about these! Attending an event like The Handmade Fair reminded me of all of the small businesses out there that put their heart and soul into handmade. It's made me think differently about gifts I give others and will hopefully be returning to some of the above companies to buy some of their beautiful products. After we had our fill of looking and buying in the shopping villages. We headed to the Mollie Makes cafe and drank tea out of pretty vintage tea cups and tried a bit of colouring in. 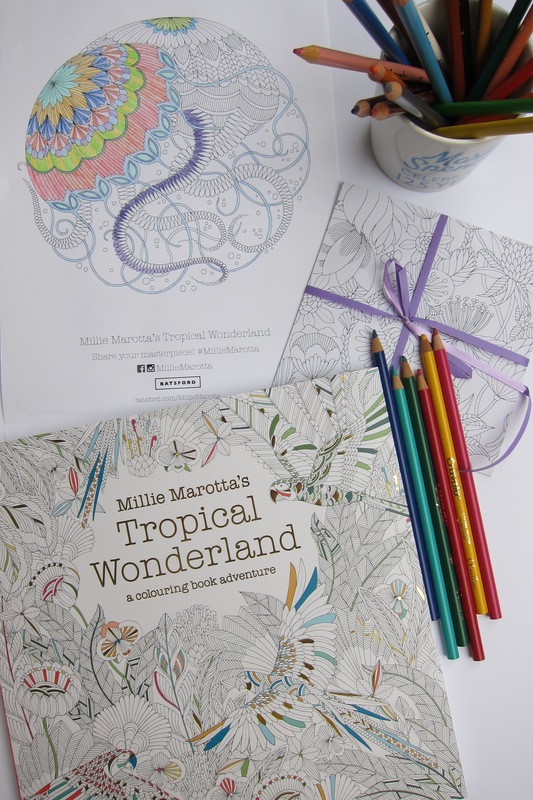 We both bought Millie Marotta's Tropical Wonderland book as we got a little hooked on the colouring whilst we were there. The Handmade Fair was such a wonderful day out. What made the day extra special for me is that it was a shared experience with my Mum. During the day we reminised about the different crafts we had tried together when I was younger, like flower pressing, marbelling, quilling, and tapestry kits. I found out that my Mum's dad used to create rag rugs for their home using sack material and poking in fabric. We spotted someone making them at The Handmade Fair in exactly the same way and it was really exciting to see that these types of crafts don't disappear and they have resurgence. The feeling from the day was one of real joy and I felt inspired to pick up a few crafts that I had left behind in the past but also to try different approaches to the crafts I already enjoy. If you missed The Handmade Fair in September you can head to The Handmade Christmas Fair in Manchester, Kirstie's first Christmas Fair mixing festive shopping and hands on shopping.